JacpFX can help you to define your application UI in various ways. It allows you to mix FXML and JavaFX easily. The root of a JacpFX application is always the FXWorkbench which defines an application window. A workbench contains 1-n FXPerspective(s), each defining the layout of their view. 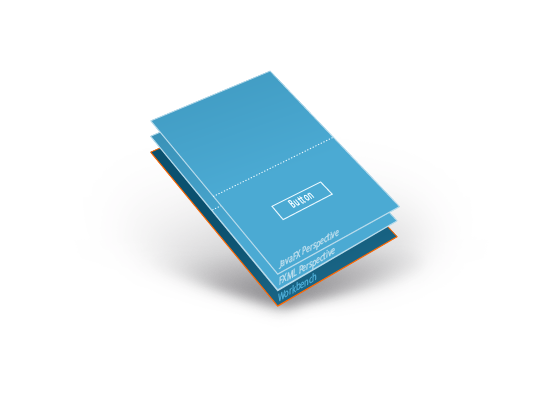 A perspective defines his view either programmatically with JavaFX or by using a FXML file. In each perspective view you can register several UI nodes as a target (placeholder) for a FXComponent view. A perspective contains 0-n UI FXComponent(s). Each FXComponent registers for a specific target (defined in the parent perspective) where it's view will be rendered. A FXComponent can represent e.g. a complex form or any other complex UI part. Like any perspective you can define the view either in FXML or JavaFX. A FXComponent can contain 0-n ManagedFragments. A ManagedFragment is a reusable custom control which can be e.g a part of a complex form (the address part) and can also be reused in other FXComponents. Like all FXPerspectives and FXComponents, a ManagedFragment can have a FXML or JavaFX view. The following example demonstrates how to define a FXML and a JavaFX perspective, how to declare the target areas for Component views and how to implement FXML- and JavaFX-Components. The first step is to create two FXPerspective(s) having the same UI, one implemented with a FXML view and the other with a JavaFX view. The code example below will produce exactly the same UI output like the FXML-FXPerspective. You are free to mix FXML- and JavaFX-FXPerspective(s) in one workbench. 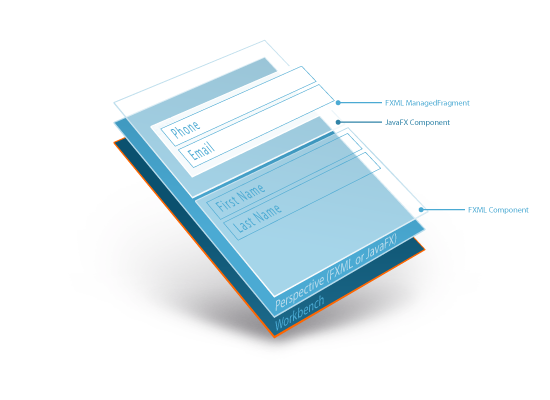 Both FXPerspective(s) define a very basic SplitPane layout with a top- and a bottom-content area. The examples above define a HBox for the top- and the bottom-area. Both Nodes can be registered to be a target for Components. 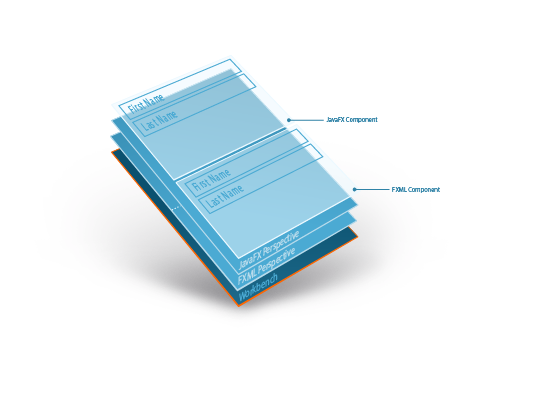 Component views are the detailed parts of your perspective view. Each FXPerspective-view can have many FXComponent-views defined in FXML or programmatically. Note: the "initialTargetLayoutId" attribute registers the FXComponent-view for a specific targetLayout defined in the parent perspective. The current FXML-FXComponent will be registered for "TARGETCONTAINERTOP" in the parent FXPerspective. The following FXComponent example will produce the same UI output as the FXML example above. The JavaFX FXComponent will be registered for "TARGETCONTAINERMAIN" in the parent perspective. 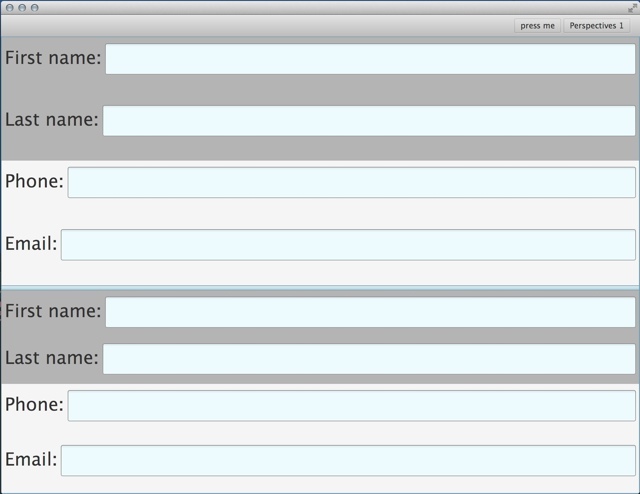 The resulting application will show both (the FXML and the JavaFX-FXComponent) in one FXPerspective. The next (optional) step is to create reusable controls, the so called "ManagedFragments". A ManagedFragment has access to the parent context (of the FXComponent or FXPerspective), can use dependency injection like any other FXComponent and can be used to create parts of your view. Like any other FXComponent or perspective a ManagedFragment can define it's view either in JavaFX or FXML. The same UI can be also achieved using plain JavaFX. In this case a ManagedFragment extends a Node / Control. ManagedFragments can be used in FXPerspectives or FXComponent. To create a new fragment instance, the JacpFX-Context provides a method to create a typed fragment-handler. The following example will create a ManagedFragment in ComponentOne and include the fragment view to his FXComponent-view. Note: The same ManagedFragment class can be reused in any other FXComponent or FXPerspectives. Detailed documentation about context access and the scope of ManagedFragments can be found in the documentation section.